Greg grew up fishing and waterskiing on the lakes and streams of mid-Ohio. He moved to Colorado in 1995 and has been chasing trout ever since. Greg, his wife Pam and their daughter Kylie now live on the Colorado Front Range. 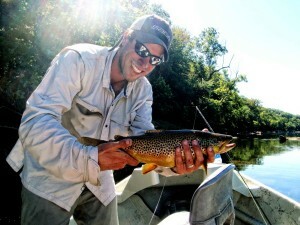 Greg has fished throughout the Western United States, from Alaska to New Mexico, and began full time guiding in 2006. Greg and his clients have been throwing dry flies throughout Rocky Mountain National Park and the Front Range for years. Greg has developed a talent for helping people chase fish in the places no one else can find. He is a gifted teacher and a talented angler. He strives to remain professional yet have a great time with every guest. He met Andrew Peterson while attending his boat certification program in 2008 and started working with him right away. Since adding float fishing to his quiver, the Colorado River has quickly become one of Greg’s favorite rivers to float. He loves the big scenery, the big flies and the big fish. Greg will fish any season but tends to spend his winters tying flies, and snowboarding.